The "New" CCF Skill Chart 2016 is here! In addition to the modifications of our new CCF Programs we have now also modified the CCF Skills Chart that we base our "Big Dawgs Test" on! 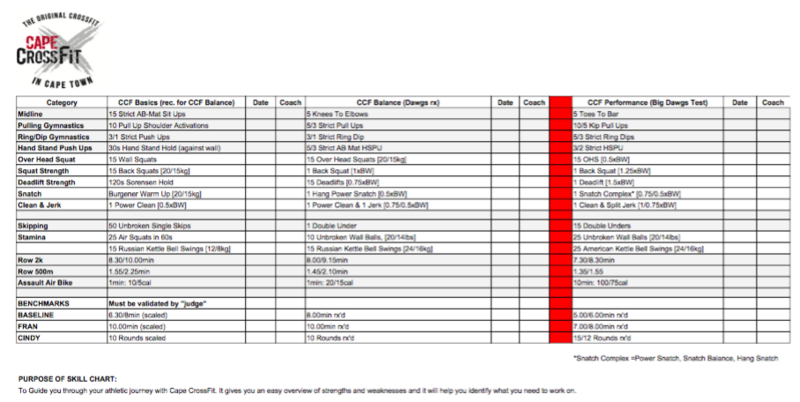 With the introduction of the "CCF Balance" and "CCF Performance" programs we also thought that it would be perfect to upgrade and improve our Skill Chart that we use to measure your improvements with us at Cape CrossFit with! What does the CCF Skill Chart do? The Skill Chart is there to allow you to track your athletic improvements with us at CCF. We are very proud of our programming structure as it have over and over again proven to take members from their current level way beyond what they thought was possible. The Skill Chart is there for you to have measurable goals to aim to "tick off" and also for us as coaches to be able to spot general & individual weaknesses that we can then address in the programming, and/or in individual sessions! What are the different levels and what are they meant to measure? We have a relatively low key "CCF Basics" level to tick off first where we pretty much will see most members be able to accomplish that entire level after just a few weeks/months with us - the main thing this level wants to measure is that we actually have been exposed to, and have an understanding for most movements we do in class. On the other side of the Skill Chart and other side of the spectrum in terms of athletic performance our backside contains the "CCF Wolfpack" and the "CCF Werewolf" levels which basically are the recommended levels to hit for anyone interested in competing in our potential Regionals Team ("CCF Wolfpack") or what we believe will be required as a minimum for anyone of our athletes aiming to compete at the Regionals as an individual in 2017. In between the "CCF Basics" and the backside with the super high levels of requirements we also have the two levels which most of our members will be aiming to tick off over time: "CCF Balance" and the elusive "CCF Performance". These two levels are meant to be good measures for once you have become well Balanced enough to start thinking about CrossFit as a performance based sport (at your individual level still). They will give you a good indication of what we consider being needed to join a program with slightly higher demands on skills in terms of Olympic Weightlifting and Advanced Gymnastics. What is the "Big Dawgs Test"? We have been testing our athletes for years in terms of what they are capable of and what they might need to work more on. The Big Dawgs Test have been a staple for us when it comes to deciding who is ready for higher volume and more technical training and it will now be what we use to determine who is ready for our program that we have recently named "CCF Performance" (previously "Big Dawgs"). To take the Big Dawgs Test we require a minimum of 3 months of training at CCF and we also require that you have gotten at least 10 of the 18 markers on the Skill Chart under the "CCF Performance" level signed off by your coach. We will then use a 20min Skill Session to test you on 5 of the items on the list that we believe might be challenging for you. Not to be a-holes, but to ensure that your body is ready to handle the "CCF Performance" programming after passing the test. So what's up with this "Virtuosity" thing, can't I just lift the damn weight..? It allows you to build further capacity in any area on your now virtuous technique.